ToySoft has developed a lite version of their popular imgEdit application called imgLite that provides a simple way to resize, rotate, and crop images right on your device. 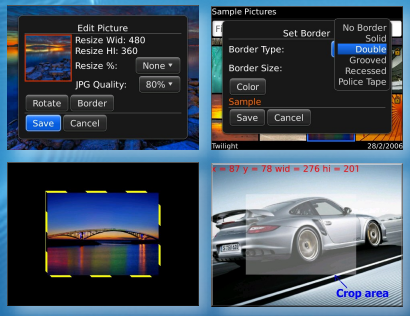 ImgLite not only gives you those options, but also the ability to add several different borders to your newly cropped/resized image, all from within the media, file, and camera apps. There are some other nice features as well, such as choosing where you want the edited images to save and what quality you want the resulting .jpg to be.